The current standard for pain control following liver surgery is intravenous, patient-controlled analgesia (IV PCA) or epidural analgesia. We have developed a modification of a regional technique called medial open transversus abdominis plane (MOTAP) catheter analgesia. The MOTAP technique involves surgically placed catheters through the open surgical site into a plane between the internal oblique muscle and the transverse abdominis muscle superiorly. The objective of this trial is to assess the efficacy of this technique. This protocol describes a multicentre, prospective, blinded, randomized controlled trial. One hundred and twenty patients scheduled for open liver resection through a subcostal incision will be enrolled. All patients will have two MOTAP catheters placed at the conclusion of surgery. Patients will be randomized to one of two parallel groups: experimental (local anaesthetic through MOTAP catheters) or placebo (normal saline through MOTAP catheters). Both groups will also receive IV PCA. The primary endpoint is mean cumulative postoperative opioid consumption over the first 2 postoperative days (48 hours). Secondary outcomes include pain intensity, patient functional outcomes, and the incidence of complications. This trial has been approved by the ethics boards at participating centres and is currently enrolling patients. Data collection will be completed by the end of 2014 with analysis mid-2015 and publication by the end of 2015. Liver resection is the optimal treatment for patients with primary or metastatic liver malignancies, benign liver tumours, and some biliary diseases[1–5]. In Canada, over 2,000 patients annually undergo liver resection, predominantly for cancer. Over the past few decades, improvements in surgical technique, better haemostatic control, and wider indications for liver resection, especially for those with metastatic disease, has resulted in a significant increase in the prevalence of liver resection surgery. There has been an increase of approximately 12% in the number of liver resections performed each year with a cumulative increase over 5 years of more than 60%. Due to the location of the liver and the propensity for bleeding during resection, surgery is typically performed through a large right subcostal incision. The subcostal incision, however, is associated with significant postoperative pain and distress which may result in respiratory complications, delayed mobilization and physiotherapy, and prolonged hospital stay. Inadequate postoperative pain management is associated with the development of chronic postsurgical pain which is costly to both the patient and society[9–12]. Intense postoperative pain is a risk factor for the development of chronic postsurgical pain (CPSP)[9–12]. Prolonged pain after surgery is the result of changes in the peripheral and central nervous system causing amplification, increased sensitivity, and prolongation of pain. It is estimated that as many as 30% of Canadians who undergo an operation will develop CPSP and the severity of acute postoperative pain is a predictor of its development. Chronic pain is costly to the patient and society in terms of direct health care expenditures, and indirect costs associated with lost productivity, as well as suffering and disability. Aggressive and effective early postoperative pain relief may prevent the development of chronic pain. Conventional techniques of postoperative analgesia include epidural catheters, intravenous opioid patient-controlled analgesia, and peripheral nerve blocks[15–17]. Peripheral nerve blocks - specifically transversus abdominis plane (TAP) blocks - have been described[18–20]. A modification of the TAP technique which involves surgeon placement of the TAP catheters directly into the open surgical wound (medial open transversus abdominis plane; MOTAP) has been investigated both at Sunnybrook Health Sciences Centre and at the University Health Network – Toronto General Division. Epidural analgesia remains the gold standard for pain control following an abdominal surgical procedure. However, complications from epidural analgesia include hypotension, bradycardia dural puncture, spinal infection, and rarely, but devastatingly, neurological damage[23–26]. Furthermore, removal of epidural catheters may provide logistic challenges if patients develop coagulopathy on the basis of liver dysfunction[27–30]. Given the above risks, many institutions do not routinely insert epidurals for patients undergoing major liver resection. Despite the variety of pain-relieving modalities available, postoperative pain following liver surgery is significant and remains a challenge to manage. Opioid analgesia, while effective at rest, fails to provide adequate pain relief associated with movement such as breathing, coughing, ambulation, and gastrointestinal motility[11, 31]. Moreover, opioids are associated with adverse effects such as nausea, vomiting, constipation, sedation, and respiratory depression. Movement-evoked incisional pain accounts for the majority of pain experienced, and the nerves responsible arise from thoracic levels T6 to T10. These nerves lie in a plane between the internal oblique and transversus abdominis muscles, known as the TAP[18, 33, 34]. The TAP block involves injecting local anaesthetics into this fascial plane, thereby blocking transmission of the sensory neurons responsible for abdominal surgical pain. Afferent sensory information from these nerves can be blocked by infiltrating local anaesthetic via a surgically placed catheter that runs in the lateral TAP (blocking T8 to T10) and extends into a second adjacent anatomical compartment, the posterior aspect of the rectus sheath (blocking T6 to T8). A variation of the TAP block, the oblique subcostal block, provides sensory blockade for surgical incisions between T6 and T10 dermatomes, including the subcostal or chevron incision used in liver surgery. A retrospective study of 36 patients demonstrated that ultrasound-guided TAP blocks significantly decreased 24-hour cumulative morphine consumption. A recent randomized controlled trial demonstrated that TAP blocks and epidural analgesia are equally efficacious in controlling postoperative pain. However, due to the close proximity to the peritoneum and the highly vascularized liver, single-shot subcostal TAP blocks are quite challenging to perform, even under ultrasound guidance, as evidenced by two cases of liver puncture in a sample of 36 patients. In small studies, TAP blocks decreased postoperative opioid consumption, nausea, and vomiting, while providing pain control similar to epidural analgesia. TAP blocks are typically infiltrated using ultrasound guidance at the conclusion of the operation. Preliminary uncontrolled studies and case reports have demonstrated the potential efficacy, safety, and patient satisfaction of TAP catheters[20, 36]. We have recently developed a modification of the TAP technique for regional analgesia following subcostal incisions termed MOTAP catheter placement. This technique involves surgical placement of the catheter under direct vision. During subcostal incision these muscular planes are clearly visible, allowing more confident insertion of a catheter directly into the correct plane. In a pilot study, 22 fit adults undergoing donor hepatectomies received TAP catheters at the end of surgery. The patients received the first dose of bupivacaine (0.2 cm3/kg 0.125%) at the end of surgery and this regimen was repeated every 12 hours until postoperative day 3. We compared postoperative pain scores and opioid use to historical controls and found a significant (P < 0.05) difference in cumulative postoperative opioid (hydromorphone) consumption at 48 hours (mean ± SD: 20.8 ± 15.8 mg for MOTAP catheters vs 39.1 ± 25.1 mg for patient-controlled analgesia (PCA)). To assess the impact of MOTAP catheters plus intravenous, patient-controlled analgesia (IV PCA) compared to the standard of care (that is, IV PCA alone) on opioid consumption in patients undergoing hepatic resection requiring a subcostal incision. Opioid-related adverse effects, including nausea, vomiting, pruritus, sedation, and postoperative ileus. Time to ambulation, duration of hospital stay and reduced postoperative pain disability. Post-surgical complications (for example, pneumonia). Incidence and intensity of chronic postsurgical pain. 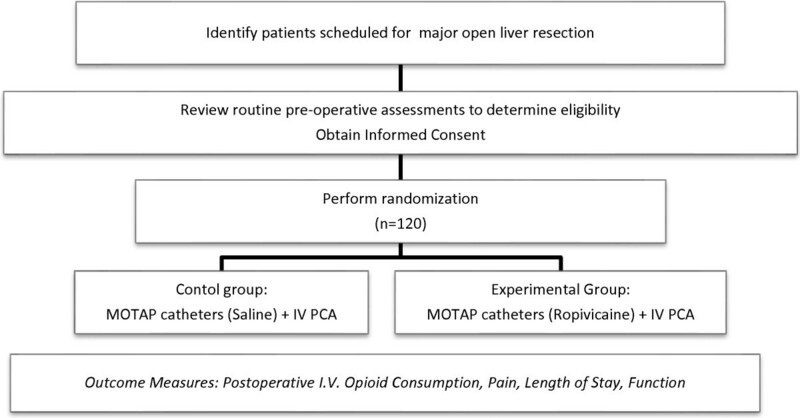 This is a multicentre, prospective, blinded, randomized controlled trial comparing MOTAP catheters plus IV PCA to standard care (IV PCA alone) in patients undergoing subcostal incision for liver resection. Full inclusion and exclusion criteria for the trial are summarized in Table 1. The trial has been approved by the Toronto Academic Health Sciences Network Research Ethics Boards from Sunnybrook Health Sciences Centre (178–2013) and from the University Health Network (12-0493-A). MOTAP, medial open transversus abdominis plane. Patients meeting the eligibility criteria will be recruited at the preoperative surgical consent visit or the anaesthesia pre-assessment clinic. Information pamphlets will be provided and written informed consent will be obtained. At the time of enrolment, patients will complete baseline questionnaires: the ‘Preoperative Current Pain and Pain History Questionnaire’, Numeric Rating Scale (NRS) for Pain Intensity and Pain Unpleasantness, the Pain Catastrophizing Scale (PCS), the McGill Pain Questionnaire - Short Form-2 (SF-MPQ-2)[32, 33], and the Hospital Anxiety and Depression Scale (HADS). Patients will be randomized to one of two parallel groups: experimental (local anaesthetic through MOTAP catheter) or placebo (normal saline through MOTAP catheter). Each research pharmacy will have a concealed randomization list and the appropriate syringes will be dispensed by the pharmacy. The code will be retained centrally and only revealed to the investigators once recruitment and data collection is completed. Randomization will be stratified by centre. A brief schema and study outline of this trial is summarized in Figure 1. MOTAP study schema and study outline. IV, intravenous; MOTAP, medial open transversus abdominis plane; PCA, patient-controlled analgesia. All patients will undergo routine preoperative testing at the preadmission clinic to confirm fitness for surgery (medical history, electrocardiogram, blood work, and so forth). No additional tests are required beyond standard-of-care for patients undergoing liver resection. Patients will undergo routine anaesthesia and liver surgery with no additional requirements for this study. No preoperative oral analgesics are permitted, including non-steroidal anti-inflammatory drugs, gabapentin, and acetaminophen. Epidural catheters, intravenous lidocaine, and ketamine are not permitted. Surgery will be performed through a right subcostal incision. An upper midline extension or limited left subcostal extension is permitted. All aspects of the liver resection will be left to the surgeon’s discretion. Local anaesthetic may not be infiltrated into the surgical wound. Following liver resection, the operating surgeon will insert two catheters. The following muscles will be identified: rectus abdominis, transversus abdominis, internal oblique, and external oblique. The surgeon will dissect between the internal oblique and transversus abdominis fascia superiorly to open the TAP. A plane will also be developed between the rectus muscle and the posterior sheath. The first catheter will be placed subcostally in the anterior axillary line, between the transversus and internal abdominal muscles. The second catheter will be sited at the lateral border of the right rectus abdominis muscle, between the posterior rectus sheath and the rectus abdominis muscle. Approximately 10 cm of catheter will be left in each plane, and tunnelled to skin sites distal to insertion. The catheters will be secured under occlusive sterile dressing, and covered with tape. The skin will be closed using either staples or suture at the surgeon’s discretion. The catheter will be fastened to the skin using steri-strips and an occlusive sterile dressing. For the TAP catheter we will use the 001159-20D InfiltraLong 600 T (manufacturer Pajunk, Germany) and we will use a standard three-orifice catheter for the rectus space. The study lead at each site will be responsible for ensuring that all participating surgeons adhere to this technique of MOTAP insertion. Prior to enrolling a patient, each participating surgeon must perform at least one MOTAP insertion with the site’s lead present to become credentialed in the technique. We will audit the insertion technique of each surgeon at least every five cases to ensure consistency. At the conclusion of surgery, both catheters will be bolused with 20 ml ropivacaine 0.2% followed by a continuous infusion through each catheter of ropivacaine 0.2% 5 ml per hour. At the conclusion of surgery, patients in the control group will have 0.9% normal saline 20 ml bolused then a 5 ml/hour infusion into each catheter. Patients in both groups will be prescribed celecoxib 200 mg orally twice daily (if baseline serum creatinine is less than 90 μmol/l), and IV PCA hydromorphone 0.2 mg bolus with a lockout time of 5 minutes and no background infusion. If patients have inadequate analgesia with this regimen the bolus dose will be increased to 0.2 to 0.4 mg bolus and the TAP catheter infusions will be increased to 7.5 ml/hour in each catheter. If pain is still inadequately controlled, patients will be started on a continuous intravenous infusion of hydromorphone 0.2 mg/hour in addition to the bolus PCA dosing. If pain is still inadequately controlled, the study coordinator will be contacted and the patient assessed by the study site lead. Patients may receive additional opioid boluses to control acute intractable pain while the IV PCA dose is being adjusted, at the discretion of the acute pain service clinician or the post-anaesthesia care unit nurse caring for the patient. These doses will be recorded and included in the measurement of total opioid consumption. Serum creatinine will be monitored daily in the postoperative period and, if it increases above 90 μmol/l, the celecoxib will be discontinued; however, patients will remain in the trial. The MOTAP catheters will be removed on the morning of postoperative day 3 in all patients. This will be a blinded, placebo-controlled study. All patients, clinicians, and data collectors will be unaware of the group allocation. A pharmacist not involved in patient care will dispense the study medications according to the computer-generated randomization list. The primary endpoint is mean cumulative postoperative opioid consumption over the first 2 postoperative days (48 hours). Both IV PCA opioids and oral opioids will be recorded from the patient’s medical records daily, converted to morphine equivalents, and compared between the two groups. The following information will be collected at regular intervals as a measure of the primary endpoints: cumulative IV PCA opioid consumption every 12 hours for 72 hours as well as total opioid consumption for the entire hospital stay. NRS  scores for pain at rest and with coughing (0 = no pain, 10 = worst possible pain) three times daily (TID) for 48 hours and then daily until discharge. Preoperative Current Pain and Pain History Questionnaire, NRS for Pain Intensity and Pain Unpleasantness, PCS , SF-MPQ-2 [32, 33], Pain Disability Index (PDI) [36, 37], and HADS  at baseline. NRS patient satisfaction scores regarding pain control (0 = totally satisfied, 10 = totally dissatisfied) TID for the first 48 hours and then daily until discharge. NRS for Pain Intensity and Pain Unpleasantness, PCS , SF-MPQ-2 [32, 33], and HADS  on the day of discharge. Long-term pain Follow-Up Pain Questionnaire, PDI [36, 37], PCS , SF-MPQ-2 [32, 33], HADS , and The Follow-Up Questionnaire 6 months following surgery (via a routine follow-up telephone call). In-hospital opioid-related side effects - presence of nausea, vomiting, pruritus, and dizziness (assessed TID for the first 48 hours, then daily until discharge). Sedation scores, measured TID for the first 48 hours, then daily until discharge using a standard sedation scale (0 = alert, 1 = mild (occasionally drowsy, easy to arouse), 2 = moderate (frequently drowsy, easy to arouse), 3 = severe (somnolent, difficult to arouse), S = normal sleep, easy to arouse). Time to first bowel movement. Incidence of in-hospital complications, graded using the Clavien classification . If, at any time, the patient is found to be ineligible for the protocol as designated in the section on eligibility the patient will be removed from the study. Patients who are not extubated within 4 hours from the end of the operation or who are reintubated within 48 hours from the end of the operation (including a return to the operating room) will also be excluded from the primary analysis, although we will continue to follow them while in hospital. Patients who wish to withdraw from the study at any point in time will be able to do so. All statistical analyses will be performed using SAS software version 9.2 (SAS Inc., Cary, NC, USA). All tests will be two-sided and significance will be considered at P < 0.05. Mean cumulative postoperative opioid consumption during the first postoperative 48 hours will be reported for the two groups as mean ± standard deviation. The two groups will be compared using a two sided t-test. Our pilot data consisted of 111 patients that had undergone liver resection surgery between April 2004 and January 2009 prior to the use of MOTAP catheters when postoperative pain relief was provided by IV PCA hydromorphone alone. Cumulative hydromorphone consumption over the first 48 hours after surgery was 39.09 ± 25.07 mg. Based on our experience with the use of MOTAP catheters following adult liver donation surgery, we have found a reduction of 47% in mean cumulative opioid consumption over the first 2 postoperative days (48 hours). Patients receiving MOTAP catheters consumed a mean ± SD of 20.81 ± 15.8 mg of hydromorphone. The difference of approximately 18 mg over 48 hours is clinically significant and represents a reduction of almost 50%. To be conservative, we will estimate a relative reduction in mean cumulative opioid consumption of 40%. Assuming a baseline opioid consumption of 39.09 mg with a standard deviation of 25.07, a sample size of 58 patients per group will achieve 90% power at a significance level (alpha) of 0.05. We will round up to 120 patients in total (60 patients in each group). Data from this study will help us optimize postoperative pain management in patients undergoing liver resection. It will assist us in developing a standardized protocol for pain management for these operations. Based on the results of this work, we hope to further test the efficacy of these catheters in other surgical cohorts in which upper abdominal incisions are used and where central neuraxial blocks are either contraindicated or refused by the patient. Better control of pain will help improve patient’s pain experience, mobilization and physiotherapy following surgery, reduce pain disability and possibly decrease the incidence and intensity of CPSP. Toronto Academic Health Sciences Network Research Ethics Boards from Sunnybrook Health Sciences Centre and from the University Health Network. The authors would like to thank their research assistants who play a vital role in the day-to-day management of this trial. This research is supported by the Innovation Fund of the Alternative Funding Plan from the Academic Health Sciences Centres of Ontario. PK conceived the study, participated in the design, coordination, and data collection of the study, and wrote the first draft of the manuscript. SC and PM participated in the design, coordination, and data collection of the study, and revised the manuscript. SM, JS, SL, CL, AW, NC, RK, JKa, SC, and JLM participated in the design and data collection of the study, and revised the manuscript. AK participated in the design and statistical analysis of the study, and revised the manuscript. JKh participated in the design of the study, and revised the manuscript. HC conceived the study, participated in the design, coordination, and data collection of the study, and revised the manuscript. All authors read and approved of the final version of the manuscript.